Maybe by now you’ve had a chance to check out Pinterest, the website where you can ‘pin’ photos from the internet to your personal ‘pinboards’. Occasionally you might even come across photos from your very own blog! WARNING: I have found Pinterest to be extremely addictive and now know it should not be viewed unless one is prepared to abandon all previously scheduled activities and perhaps be willing to skip a meal or two while under its spell. 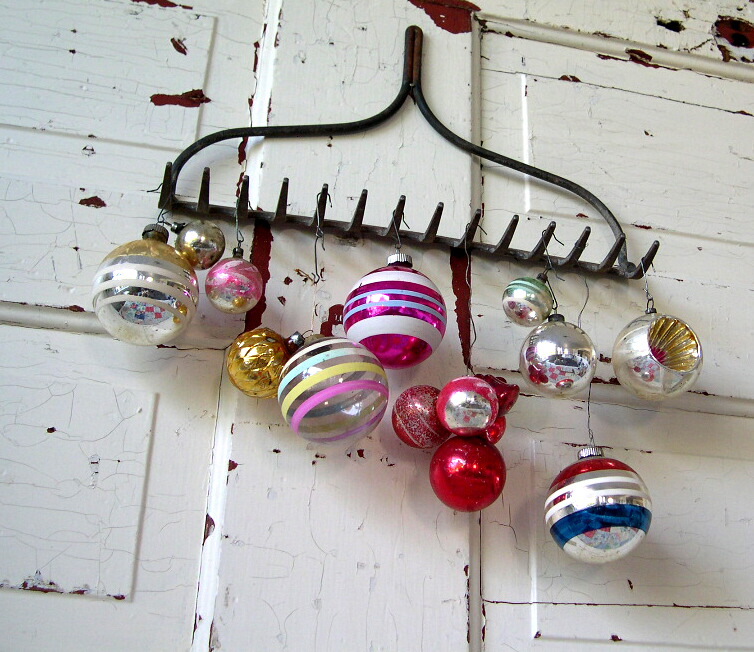 One photo from this blog that’s been pinned is this vintage ornament tree I made last year. I love it! And she was so clever to do this on a real door – why didn’t I think of that? See all of her photos on her blog, Willow & Paisley. Now I’m wondering…are there more of these vintage ornament trees out there? In other news, the exciting Third Annual Academy of Vintage Christmas Ornament Arts and Sciences Award Ceremony (um, does that name get longer every year?) is underway over at Oodles and oodles. PS You can click HERE to see what I’ve ‘pinned’ onto Pinterest. I’m going to stop saying ‘pin’ and just say pin now. Pin. I agree, it's so addicting! I want to have all these gorgeous pin boards blown up and hung all over my walls. I have heard about how addictive pinerest is and have been avoiding up until now. You may have lured me over! I gave in to pinterst a week ago. WHAT WAS I THINKING???? I've lost all of my productivity! I love pinterest...you are right, though, only go there if you plan on spending hours touring the web! You put two links to other places in your post and then I got sucked down the rabbit hole of those other pretty blogs. Next thing you know it's taken me 1/2 an hour to remember that I was visiting you in the first place. Reading your blog is almost as addictive as Pinterest. Almost. thanks for the link that you can use to see if you've been repinned - I always wondered how to do that! I can relate ;) Yes, I'm addicted. Pin to Vintage. Could you possibly be any cleverer? Cleverererer? More clever? 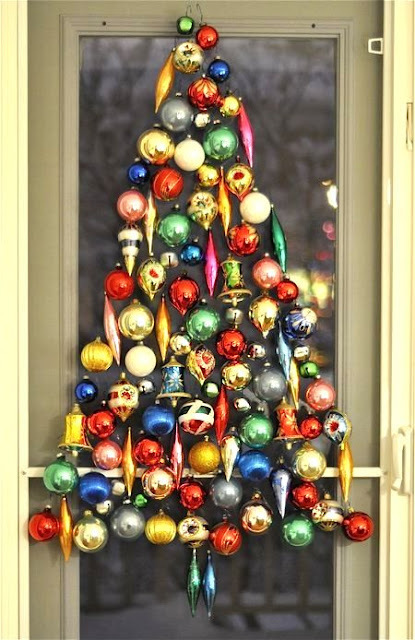 How fun to see other versions of the world famous ornament tree. You continue to inspire the masses, Amy. Hey, I've got an idea! How about if I put that picture on my blog. With any luck, maybe people will pin it from my blog and think it's mine! Doesn't that sound like a good plan? I think I'll go do that right now. Thanks for sharing the link to see if a photo from our blog has been pinned. Wow! I had no idea that people really liked what I'd been doing!! If the Academy branches out into Best Christmas Tree Made with Vintage Ornaments, you're certainly a shoo-in to win. I love that tree. And I am afraid of Pinterest, but I suspect I'm about to overcome my fear. I've seen so many bloggers doing the "pinterest" thing...so now I can check it out! Thanks for sharing the info! I found you through pinterest! LOL! Yes, i'm addicted too! I know that search technique well. What it doesn't show you is all the pins from your Etsy store, since those only show "Etsy" as the photo credit. I"m still trying to figure out how to find those links other than using Google. Anyone know the secret to that? Thank you for sharing the way to find our stuff. I was glad to find that the photos lead back to their original source. Your ornaments are so incredibly cute! I wish they were mine. warmest wishes for a healthy and merry christmas! Yes, it's easy to lose track of time when you're on Pinterest! Just discovered your blog through Renee's Sewn With Grace site and love all the vintage goodies. I'm your newest follower and look forward to reading more! I like the way you decorate with your vintage Christmas decorations. Have a happy new year with lots of joyful events! What a wonderfully nostalgic tree, I love it! Thank you for including me on your blogroll! Today has been full of sweet surprises. wishing you a creative and blessed new year, miss amy! thanks for blessing all of us with your inspiring and beautiful creative goodness that you are such an expert at! Pinterest is so fun! (and addictive) I think it's such a fun way of sharing ideas!